The kind of toys that I dreamed about having when I was eight years old has finally become a reality. 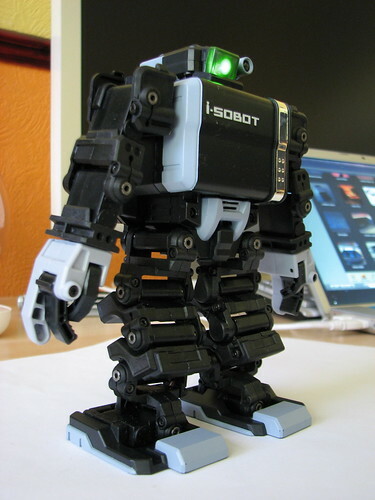 The Tomy i-Sobot is one of the most advanced toy robots on the market today. 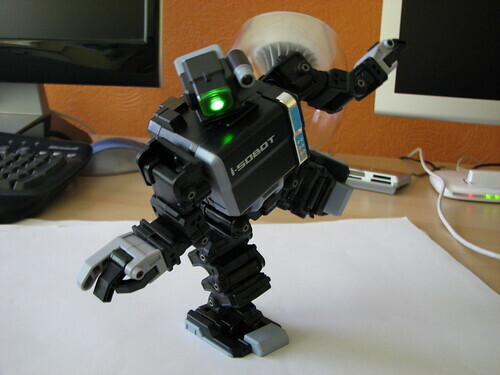 At just 16cm high, the i-Sobot has 17 servos for realistic movement and balance. 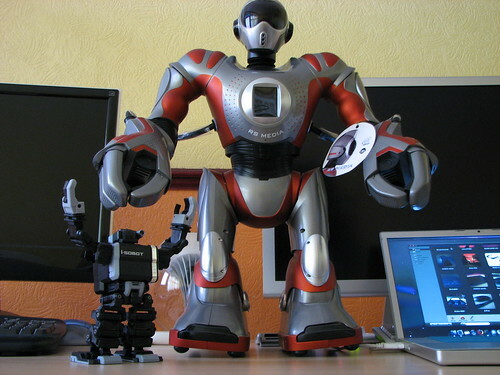 Touted as the worlds smallest mass produced bipedal robot, the i-Sobot is small enough to sit in the palm of your hand. 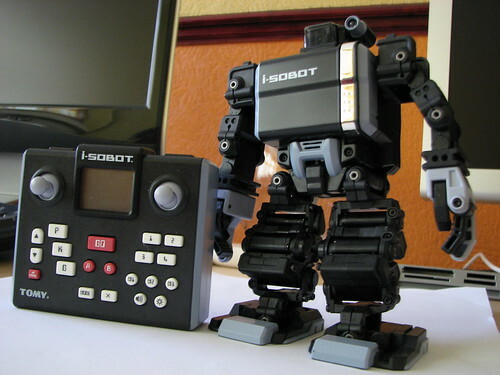 The i-Sobot responds to controls from the infra-red remote (powered by 3x AA batteries). The robot itself is powered by 3x AAA NiMH batteries which are included along with the charger allowing for up to an hour of continuous use. Using the remote, you can choose from the four different modes which affects what movement the i-Sobot is capable of. One of the four modes allows you to control the robot using your voice – however the commands are limited and are not programmable. Switch it in to remote control mode and you get basic movement using the joysticks for movement of the limbs and the body as well as some pre-programmed action moves including a double backhand and the splits. For the real eye-candy though, you need to select the special action mode, where you can get a range of programmed sequences that i-Sobot can perform. From balancing on its head whilst waving its feet in the air to performing t’ai chi, i-Sobot will leave a smile on anyone’s face when they see what it can do for the first time. For a party trick and a quick laugh, there’s also the tropical dance routine that will be popular with both the younger and older generation. Perhaps a joke or two when you’re feeling blue may also be ideal, not a problem with i-Sobot. Despite the extensive list of pre-programmed moves, things can get repetitive after you’ve seen the i-Sobot’s best tricks for the hundredth time, so you’ll be glad to know that there’s a programmable mode for linking together moves and performing tricks of your own. The possibilities are endless, especially when you consider introducing props in to the equation. With 17 servos driving the movement of the i-Sobot, there’s some pretty impressive moves that it can pull off, the kind of moves that used to be demonstrated at trade shows and technology conventions. What amazes me is the progress that has been made in the miniaturisation of the servos and how flexible and capable that home robots have become…and to a certain extent quite scary. Tomy have further pushed the boundaries of what’s possible by combining state of the art robotics technology in a format that can be easily understood and enjoyed by both the younger and older generation. Cooooooooool! I didn’t realise how far toy robots have come. Cool video. Looks like things have moved on since the days of Lego Kinda reminds me of that Asimo robot thing from Honda. Awesome video.. man this Robot made me laugh! Keep up the good work..